Extending the possibilities of the playful, colorful DLS Profile, the new DL4S is equipped with enhanced version of the ROBE RGBW LED module for brighter saturated colours and more powerful output. To magnify the already perfectly smooth colours, fades and dimming, the DL4S features innovative LED driving system for improved, extremely high definition dimming curve for all R, G, B, W colours, with 18 bit resolution. The DL4S adds a system of 4 fast, smooth, framing shutters within the optical path design of the proven DLS Profile format. There is individual control of each shutter blade position and angle, together with rotation of the complete framing module. 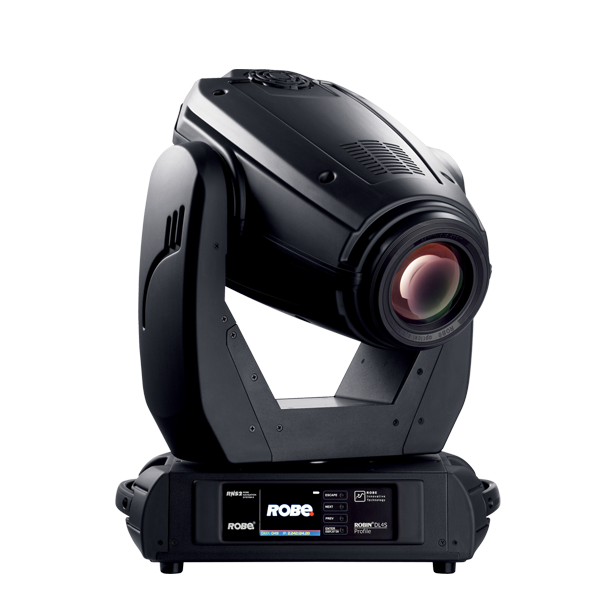 As well as providing a sharp precise or soft frame for the projected image, the system produces a new series of effects through pre-programmed shutter blade shape and movement sequences. As with all models in the Robe DL luminaire range, the multiple shadows normally associated with an LED source have been eliminated. The enhanced Robe RGBW LED light source reproduces both rich and pastel colours at output levels normally associated with 1 200 W discharge fixtures as well as pure whites at preselected 2 700, 3 200, 4 200, 5 600 and 8 000 kelvin colour temperatures. The tungsten emulation function allows the fixture to be integrated seamlessly into lighting schemes with existing traditional lanterns. Strobe effect: Variable speed, 20 flashes per second max.